My grandma makes the most delicious food. I swear, she does. What she does best is actually something that only now I’ve come to realize is a very strategic and marketing-ly thing. And we should all learn from that. You go to my grandma’s for an innocent visit, and even if it’s not lunch time, she will wait for you with your favorite childhood meal. The one you wish you could eat every time you’re sad, sick or… yes, actually, any day of your adult life. More important: the one meal she makes best. This is how it all starts. Maybe you just ate at home, but… how can you say no to her? So you sit, and you eat away. You manifest how good it tastes, you can’t help it. So she brings more, and you eat it. Right then, she performs her best trick. Let me explain. “Milanesita” is the diminutive of milanesa, which is a type of breaded meat we eat in Argentina. Back to our story: you just ate a whole meal, maybe pasta or chicken. And when you’re finished, she doesn’t offer you dessert or tea, she offers you another main course that apparently she had also spent the last hours cooking. This calculated-minded grandma didn’t tell you from the beginning that these were the two meals she prepared so you could choose the one you want or make room in your stomach for the second one. Nope, she knows what she’s doing. And maybe every Argentine you meet will tell you his grandmother makes the most tasteful milanesas, but you should know that’s not true… my grandma makes them. You accept one milanesa. Because… it’s your grandma’s milanesas. How can you say no to her? And before you noticed, you’ve spent more than four hours at your grandma’s, eating and talking and eating and talking, and you weren’t even hungry! Wasn’t it all she wanted? ✓ Receive your visitors with something they will value, that only you can offer or that you can offer in a special, different way. ✓ Don’t tell them from minute zero that you also have that other thing they’ll want. Don’t force them to choose, let them enjoy each part at a time. ✓ When the right moment comes, offer them your second best thing. That one that they won’t be able to say no to. ✓ When something is as good as your grandma’s food, it’s never enough. Don’t ever stop offering value. If you have a blog and you’re not doing this yet, then you must. Having a good piece of content but then a blank no-action space at the bottom makes no sense. If you want to keep your visitors on your website longer, then you should offer them more content to consume. Having a related posts section at the end of a post is one of the ways to do that. There are many plugins in WordPress to show related posts. These two are some of the most popular ones. Also, Yuzo Related Posts is the one we use on this site. It has great performance and we love it. This is a great way to offer your readers another piece of content they’ll probably want to read, right before they finish the current reading. The box will appear after the user has scrolled down, and you can decide how much you want users to scroll down before the box appears. This plugin includes other nice settings such as: displaying more than one post, the post excerpt, the post featured images, and more. You should absolutely give it a try! If you want to see a live video tutorial on how to use this plugin and other cool WordPress stuff, join The WordPress DIYer Facebook Group and watch it here. Want to make sure your site is ready an optimized for your visitors? Download the ultimate WordPress website checklist now for free. This plugin lets you offer related posts to your readers right in the middle of the content. So they don’t have to finish a reading to see if there are other posts that may be interesting. Instead, you can entice them to browse related content before that. If you do a good job (and if you’re lucky) your visitors will end up opening several tabs from your website and spending a lot of time in there reading interesting stuff from you. After you install the plugin and activate the Inline Related Posts functionality, you’ll automatically see the box appearing in the middle of your posts content. You can customize the box design by adjusting some simple options. And you can also configure the specific behavior of the plugin and define how it should discover similar posts (based on categories, tags or both). So, there’s one last part to my grandma’s story I didn’t tell you about. When you already ate all you could and you are about to leave, she pulls out of the sleeve her final move: she gives you a plastic container with some extra milanesas for you to take home. And that’s exactly what you should do with your readers. How do you do that? Well, not with food but with a content upgrade. A content upgrade is a bonus piece of content you offer to your readers. Something that they can get exclusively by subscribing to your list. They read a post they liked in your blog and then you say to them “Want to read this another thing I wrote that’s extremely valuable? Enter your email and I’ll send it to you”. This extra content you offer can be anything you want. It’s great if it’s related to the content on your post but it goes a bit dipper in one aspect of it. For example, if you write a post about camping, you may offer as a content upgrade “The ultimate checklist for camping”, or “The 5 things you must do to prepare yourself to camp”. It can also be some sort of template or a printable. If you wrote a post about how to get organized at work, you could offer a printable planner or something like that. 2. valuable, so people can really take advantage of it and feel grateful you created that for them. What’s the purpose of the content upgrade? If this isn’t obvious yet, then the main purpose of the content upgrade is to collect leads for your mailing list. You’ll have the email address of people interested in what you write about. That means an audience. That means, potential buyers or clients. People you can then write to the periodically, build a relationship with, and offer your products or services. Now, from the technical point of view, how can you offer a content upgrade? First, you’ll need an email marketing provider, such as ConvertKit, Mailchimp or Drip. That’s what you’ll use to subscribe your users. Whatever platform you choose, you’ll want to set up an initial email sequence that your subscribers will get. This sequence should have at least one email, the email where you send the content upgrade they’ve subscribed for. But of course, I recommend you to create a longer sequence so you get your subscribers into your email marketing loop. The second technology involved is the one you’ll use on your site to get people to subscribe. What you need is simply a form that automatically connects with your email marketing service, so when people enter their email the whole system starts running. You could always use for this an embed form from your email provider. They all have them and should work pretty well. But there are also a few marketing tools more suitable for this purpose. One of them is OptinMonster, which offers a variety of solutions to make your email list grow. You can connect OptinMonster to your email provider and use their forms right on your website in many ways: popups, full-screen welcome mats, exit-intent popups, floating bars, inside-content forms, and more. And if you’re using one of our modular WordPress themes there’s a Leadbox module in them that will let you create subscribe forms that connect to your email service provider, without having to use an extra plugin. 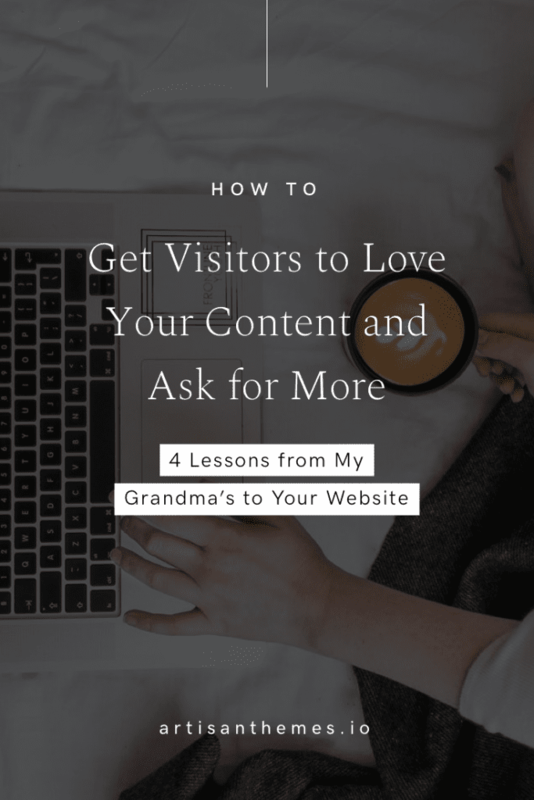 Which one of these grandma tactics will you apply on your website?